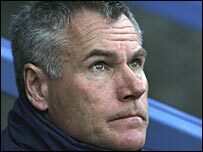 Hull City boss Peter Taylor has pulled out of the running to be the new manager of Charlton. The England Under-21 coach was among the favourites to land the post and had an interview with the Addicks earlier in the week. But, in a surprise move on Thursday, he ruled himself out of contention. "Every day I've thought about it, thinking that my heart is not in it. My heart is staying with Hull City," Taylor told BBC Radio Humberside. "When you get that gut feeling, I think you should stay put. "I'm very proud of what's been achieved at Hull, and I still think there's more we can do and it's a great football club. "I know me and the chairman had a few rows in the early part of the week, but we've also got a great relationship, so I don't want to leave." Former Addicks boss Alan Curbishley decided to call time on his 15 years as manager at the end of the season. Former Sunderland boss Mick McCarthy and Colchester boss Phil Parkinson have also been linked with the south London club, and they may benefit from Taylor's surprising about-turn. The 53-year-old former Leicester boss spoke of it being "a privilege and an honour" to have spoken with Charlton but conceded he had not convinced himself it was the right move. Since taking over as Hull boss in October 2002, Taylor has led them from League Two into the Championship.